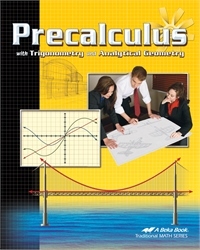 Establish a firm foundation of basic calculus and trigonometry with this Precalculus textbook. This text covers solving trigonometric equations, intercepts and symmetry, ellipses and parabolas, graphing techniques, functions, reference triangles, complex numbers, limits, and more! Complete with detailed explanations, practical applications, and ample practice problems, Precalculus with Trigonometry and Analytical Geometry will prepare your child for more advanced mathematical adventures.